Username is used everywhere. You have to choose it while creating a new email address or in your social media accounts. Finding a new username sounds easy but actually it is a very hard task. This is because, once it is registered, it will be reserved for that particular person only and no one can use it again. Thousands of new accounts are created daily and as a result of which, common usernames are no more available. It's like a girlfriend, the one you likes is already taken by anyone else (LOL). 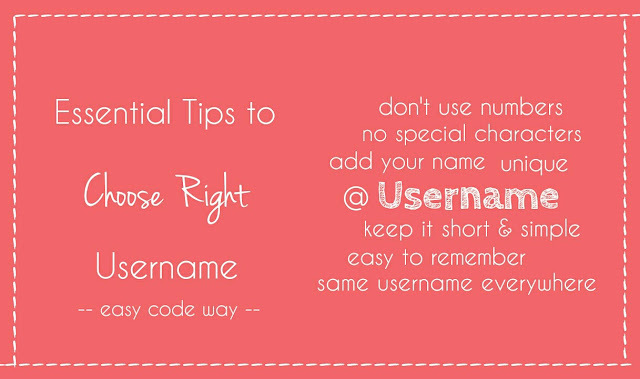 If you're in dilemma on what username to choose and what not, then this tutorial is especially for you. Here are some essential tips and examples which you should keep in mind. Username is made up of two words which are user and name. It represents your real identity so it is very important to add your real name in it. Imagine how it would be if your username will be in name of your favorite car or bike. It will be hard for other people to find you and on the other hand, it leaves a bad impression. Obviously, you can't get the username on your real name as it was already taken but make sure to add it anywhere with few extra words like "its", "me", "iam" etc., before or after it. For example, If your real name is Vivek Chaudhary, you can select usernames like itsVivek, iamVivek or meVivek. Unfortunately, they are not available for me, so I added my surname short form at the end and then got @MeVivekCh as my final choice. In the same way, you can find it for your business page as well. If your choice isn't available, then add "official" word before or after it. Our business page on Google+ has @easycodewayofficial username. Another important thing to remember is that, it is not necessary to add your full name. This will increase length which isn't good. Simply add your first name only and keep it short, simply and unique. As we all know that first impressions is the last impression. In the same way, if your username will look awkward, it will reflect a bad impression. Very hard to remember - Usernames with numbers and special characters are not easy to remember and due to this reason, many people hate them. It will be hard for other people to mail and tag you. So avoid them. Counts toward length - Username should be short and then only it will be easy to remember. If you'll add unnecessary numbers in it, definitely its length will increase. Not SEO friendly - The username you'll choose will also appear in the URL of your profile which will be indexed by search engines like Google. If you'll add numbers in it, your search results ranking will drop. Instead of this, it's good to target your real or business name. You can only use under score and dots to separate two words. For example, try to find out the usernames like its_vivek, vivek_chaudhary, iam_vivek or me_vivek (or use dot between them). Using brackets, comma, hash and other special characters is strictly prohibited. Unique means something different and awesome. Choose the username which is unique in its own. One of the my favorite artist, Yo! Yo! Honey Singh has @asliyoyo as his twitter username. Here asli is a Hindi word which means original and yo yo is the short name of Honey Singh. You can also add similar words to make it unique and different. Also, make sure that it looks professional especially if you're creating it for your business page. There are many websites that can help you to find out new username (Just Google search them). All what you need to type is your name and they will suggest you random examples. Short list the best one and then check their availability. If the one you liked is available, then go ahead and get it. The more short your username will be, the more easy it will be to remember it. People don't have time to note down your long username so that they can mail or contact you later. Let me ask you one simple question. Why 100 is the default police phone number all over the India? Because it is short and anyone can remember it. In the same way, you should choose very short length username. This way, other people can easily remember you. Another reason of choosing short length username is that, it will be easy to mention you on Twitter because tweets have limit of 140 characters only. Although there is no specific limit but roughly, it is between 9-12 characters or little more. After selecting your favorite username, ask yourself that whatever it is short, simple, unique and easy to remember. If your answer is yes, then definitely it's a good one. It will be pretty much easy for people to find you on your other social profiles. For example, your Facebook friends or followers can easily find you on Twitter and Instagram with same username. Instead of printing different URL's for each social profile, you just have to print a single username on your business card. It will give more professional touch. There may be thousands of people with same name as you have but if you'll keep same username everywhere, people can easily find out your profiles in search engines as well. It takes time to choose the right username. Make a list of 5 or 10 and then check which one passes all these tests. If you've any doubts or want some personal suggestions, feel free to ask me in below comment box. You can also find me on all social media sites with @MeVivekCh. What username you're going to use? Let me review it!